Happy Monday everyone. It's the beginning of another week and I hope it's fantastic for all of you. I can't wait to see what everyone has to been crafting and cooking up this week. 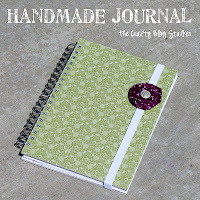 The featured link this week is The Crafty Blogstalker's Handmade Journal. This is a great tutorial. I hope everyone who hasn't already checked it out, pops over there and takes a look. Thank you for featuring my journal!! You have completely made my day! Thanks for hosting! I hope you have a great week ahead!